My review is going to highlight how the Bonavita immersion dripper manages to maintain the temperature during brewing and what features set it apart from the crowd. We will also show how Bonavita Immersion dripper compares to other industry competitors such as Clever dripper or the Hario V60. The Bonavita immersion dripper is made from porcelain. Porcelain is a much better material for conserving the heat of coffee during brewing. Other pour-over coffee brewers on the market such as the Hario V60 or the Clever dripper are generally made of plastic which releases heat much more quickly than ceramic or porcelain. This makes the Bonavita dripper is more expensive than the plastic drippers. Porcelain is a more expensive material, but it is prized for both the elegant look, and the capacity to retain heat. Another feature of the Bonavita immersion dripper is the valve that closes and opens the immersion chamber. Because very few drippers have a switch to open or close the immersion chamber, Bonavita is in the elite. It has been compared to other pour over coffee makers with this feature, including the Clever dripper, another one of my favorites. The valve is operated by a switch and you can use it to turn the dripper into an immersion coffee maker; (think French press). Like with the immersion Clever dripper, the coffee is brewed in the cone. This means that the coffee is contained within the brewer and therefore stays hotter for longer because it is not in contact with the air. The valve also sets the Bonavita dripper apart from the Clever dripper, because it can be opened and shut at will. The Clever dripper immersion chamber opens and shuts based on gravity. When the Clever dripper is placed on the rim of the coffee cup, the chamber opens and the coffee pours into your cup as opposed to the Bonavita dripper, where the user can decide when to pour the coffee from the chamber by opening the valve. The biggest advantage in my eyes is the possibility to brew both immersion and pourover, or a combination. My personal preference is immersion because it allows longer brewing time. Yes, you have to lower the water temperature, to avoid over-extraction, but the coffee brewed this way is delicious. The little details matter. A valve that allows you to adjust the drip rate, the material, (it's not plastic), and the design, all these details can make a manual dripper desirable or not. The Bonavita is. Here are some more things to consider when you choose your coffee maker. Other factors weigh in when you compare manual coffee drippers, the size, how easy it is to clean and maintain, flexibility in brewing are things that should be considered when comparing. This is going to be the subject of the next few paragraphs of our review. Again unlike plastic pour over brewers, the Bonavita immersion dripper is completely dishwasher safe. Over time plastic coffee makers can leak various chemicals like BPA into your coffee. For this reason, it isn’t advisable to wash plastic coffee makers in the dishwasher. This isn’t an issue with the Bonavita immersion dripper which is made from porcelain. This immersion brewer follows the design of traditional pour over brewers, not including the immersion chamber. The hole at the bottom of the cone is very small compared to the V60. This means that the extraction time is longer than with the V60 and the coffee needs to be ground courser. This isn’t really an issue. I personally prefer working with a finer ground coffee when I am brewing and I feel that the coffee is more flavourful, but that is just a personal thing. The courser grind means that the Bonavita immersion dripper produces coffee that tastes more like coffee from a French pot, which many people argue is the tastiest coffee. Everything comes down to taste. The Bonavita dripper is quite large (the size of the V2 V60) but because of its design, it is generally only used to brew single cups of coffee as the common practice is to brew the coffee with the Bonavita dripper resting on your favorite coffee cup. With the valve mechanism however it is possible to brew several cups of coffee in the one go, as it does have a 16 oz capacity. One thing to be said about the valve is that it does leak slightly, although not as much has the Clever Dripper. While not really a factor, as this review is mainly about coffee taste, I thought it worth mentioning that the porcelain Bonavita immersion brewer looks a lot better than the plastic brewers. This is important to me if I am hosting. The white porcelain design looks better and it fits nicely on your table. This is probably not important to most people, but there it is anyway! Cuisinart Gold Tone Metal Filter on Amazon. Perfect for getting more body with your Bonavita immersion dripper. Because of its standard size, the #4 Melitta coffee filters fit the Bonavita immersion brewer perfectly. A metal filter can also be used. This is very handy these filters are sold widely and can be easily found on Amazon. If you like your coffee bold, get the reusable metal filters. 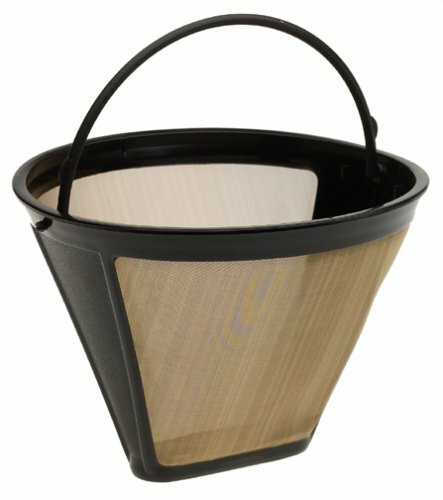 If you like a clean cup, get paper filters, they retain more silt and oil. My preference is to use metal filters, number 4 metal filters are great for Bonavita drippers. But I don't like clear coffee, my favorite brews are espresso and Turkish. A coffee brewed in the Bonavita immersion dripper reminds me of Turkish, but without the specific mud layer at the end of the cup. It's also hotter than Turkish, which needs to settle for almost a minute before you can drink it. By that time coffee is already tepid. Start by rinsing the brewer with hot water, this warms it up. As a pourover device, you just use it as any other similar device. Pour some water, let it bloom, and pour some more water. Check our brewing guide for pourover here. You have to grind coarse with Bonavita, because of the relatively small hole. As an immersion drip brewer, start with the valve closed, pour some water making sure all the grounds are wet. Let it bloom, and then pour more water, as per your recipe. Let it steep for 1.5 to 4 minutes, and open the valve. The coarser you grind, the longer the brewing time needs to be. If you love bold coffee like I do, fine grind and long steep is the way to go. Here are a couple of tutorials on how to brew with an immersion brewer. Christos Andrews's tutorial on CoffeeGeek, and Randy Glass's tutorial. The Bonavita immersion brewer has a clever design, and this makes it a product comparable to Hario V60. It can brew both full immersion and pour over, and combinations of the two. The immersion chamber and the valve greatly improve your final cup! There is nothing worse than tepid coffee. The Bonavita brewer is the most successful brewer on the market for serving a hot, but not burnt cup of coffee, which is very impressive. Personally, I still prefer products which allow for a finer grind. I give this product a solid nine out of ten. The Hario V60 is still one of the standards in the industry. One of the reasons is the fact that it requires a fine grind, which provides, in turn, a more flavorful cup.